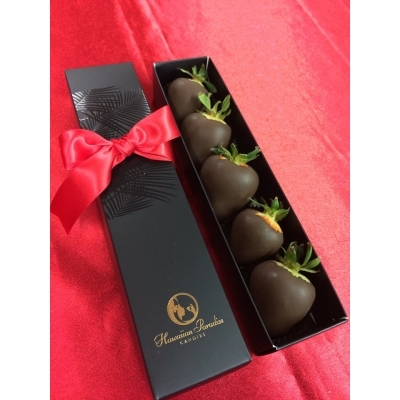 Fresh Chocolate Dipped Strawberries!!! Dipped in our signature blend of milk and dark chocolate. Mmmm, these taste sooo good! Fresh, Made to order only. Please order at least 3 days in advance. Limited quanties available per day. Small box will have 5-6 pieces, Large Box will have 8-10 pieces, depending on the size of the berries. All boxes come with a red ribbon bow. Questions, please send an email to hawaiianpc@gmail.com or call (808) 599-8777 and we will accomodate you as best we can. Mahalo!